There are many breath-taking NASA-provided "Blue Marble" images of Earth, but recently we experienced a different perception thanks to pictures taken by the Elektro-L No.1 Russian weather satellite. This perspective is quite different from NASA's pictures, Elektro-L No.1 Russian weather satellite generated 121-megapixel images that seize spectacular view of Earth. 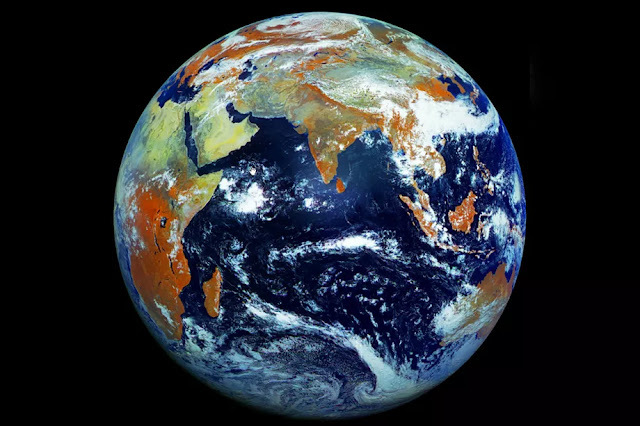 It captured the spectacular view of Earth in one shot instead of a collection of images from numerous flybys stitched together. The outcome is the highest-resolution solitary portrait of Earth yet. The image definitely appears different than what we're used to seeing, and the reason behind this is the sensor added to the weather satellite chains data from three observable and one infrared wavelengths of light, a technique that turns vegetation into the rust color that overlooks the shot.